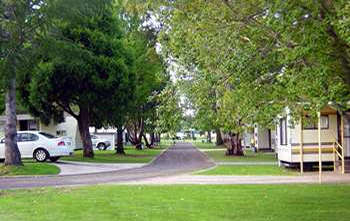 The Glen Rest Tourist Park is set in beautiful parkland with extensive conifer and liquidamber trees. 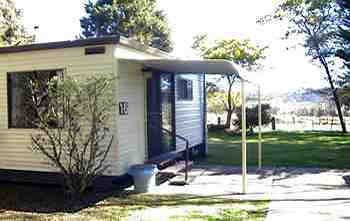 Accommodation offered includes camping sites, park cabins, ensuite cabins and powered sites. 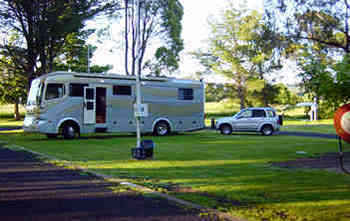 We specialise in having large sites available for those touring with motor homes or buses. We will match any caravan association membership card price, e.g. Top Tourist, Big 4 ,etc on producing a current membership card when booking in. Our amenities are clean and modern with a personal touch that's so welcome when touring. You are invited to use our Pet Wash Station for your dog. Price on application. Fossicking on our property is available ONLY to paying guests, free of charge (subject to purchase of a small bag of sapphire wash), or to members of the public who also purchase a small bag of sapphire wash from us; price on application. Free RSL Services Club bus pickup and return to Park. Your hosts are Ross and Brigitte Wilson and they understand just what's important to you when travelling or on holiday. The GlenRest is a friendly little park with BIG sites and is BIG on hospitality. Ross and Brigitte will be only too willing to help you with local information and tell of 101 places to visit or enjoy a picnic. Please enjoy your tour of our Web site. We look forward to receiving your booking enquiry. We cater for large Motor Homes. Free RSL Services Club bus pickup and return to Our Park on Thursday, Friday and Saturday nights. All cabins are self-contained and include, industry standard heaters, all the usual cooking equipment and a television. Linen is NOT provided but can be hired on request - $6.00 per bed.